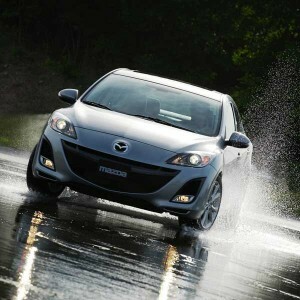 Mazda 3 is the model in the compact class with the most pronounced sporting character. The new generation is presented in two body variants, hatchback and sedan. New forms, new drawing for all tastes. Those who prefer hatchbacks are customers in Western Europe because, in the East, is still looking sedan sites with boxes for all people. Important is that the Japanese were drafted with talent both versions, which is not bad at all for those of Mazda. Design accents in the current sport trends. The new Japanese model comes with the engine for all customers, with performance, but less fuel consume. Start with 1.6 and ending with the powerful 2.2-liter turbodiesel, which was first on Mazda 6. Two versions of power – 150 and 185 hp. Motor sports rounds very quickly. Among them, 2.0-liter gasoline version, 150 hp generates a torque of 187 Nm and is moving well on the road. It sits securely on the road due to suspension. Because it is longer and wider than previous models, the new Mazda 3 has a generous interior space. From there, Japanese propellers not hear a sign that the Asians have worked well to reduce noise. Otherwise, well-chosen material, a center console with controls ergonomically arranged and placed over a display board. Good place for the driver can still look at him without any danger. Depending on the equipment, it can become a navigation system interface. Well, Mazda has always been good at this chapter. The basic equipment contains air conditioning, on-board computer and an auxiliary port for portable devices. Optionally, bi-xenon adaptive headlights (light beam changes its position towards either the right or the left), with 15 degrees. Emergency lights automatically light up emergency brake assembly. First in this class is Rear Vehicle Monitoring. The system monitors the blind spot. With the LEDs in the side mirrors, the driver is alerted so bright, but the presence of other machinery noise in his area.